A group of passing witnesseses were bathed in the meteorite's radiation and that led to the creation of some of the greatest heroes (and villains) in the fictional universe. Many of those same characters have televersions in Earth Prime-Time, but the Toobworld Dynamic should never be confused with the Wold Newton Universe. This week, Inner Toob will be celebrating the TV version of Wonder Woman, so to put my yearly Toobworld spin on the WNU I looked through the "family tree" for a character who might have crossed paths with Princess Diana off-screen. The first season of the series took place during WWII and I'm sure there are a few Wold Newton heroes from that era who could have teamed up with Wonder Woman. But she's far older than that, an Immortal from the Age of Legend. We might even suggest an encounter with some long-past character, perhaps even Hadon of ancient Opar. TV could always use a sword-flashing hero full of blood and thunder. But there's one Wold Newton colossus whom I've always wanted to see get the TV treatment: Clark Savage, Jr. also known as Doc Savage. And I think the Man of Bronze would have been the perfect candidate to work with Wonder Woman. His globe-spanning adventures may very well have brought Doc to Themyscira - Paradise Island, the Amazon home in the Bermuda Triangle. But to make it more interesting, perhaps Wonder Woman could have met Clark at an earlier stage in his life, perhaps even before he was given to adepts for training at the age of fourteen months. In 1901, most likely in November of that year, Clark Savage was born on the schooner Orion to Arronaxe Larsen and Clark Savage, Sr. This occurred off the coast of Andros Island, geographically not that far from Themyscira. Perhaps there is more to this story than had ever been revealed, which would be what the Amazons wanted in order to protect their hidden work. But I would think such a birth would almost invite some sort of calamity in which Wonder Woman could save the day. It would have to fall under fanfic since Lynda Carter, beautiful as she still is, no longer can match her earlier luminance for Diana's immortal features. And then there's the fact that Doc Savage - even as a baby - has yet to become a part of the Toobworld Dynamic. And that's not likely to happen. He's already been in a movie and a new adaptation is in development. If it is made and is successful, that would probably put the kibosh on a TV version. 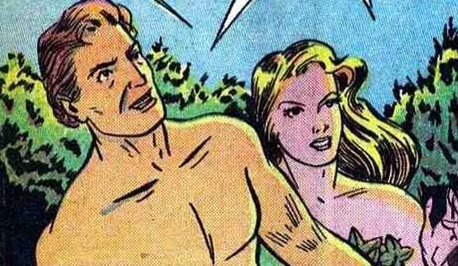 Of course maybe an ancillary TV show could be made in which Doc Savage might guest star to kick off the series. We've seen it happen before with Nick Fury and 'Agents Of SHIELD' and Conner MacLeod on 'Highlander'. I suppose it's pozz'ble, just pozz'ble, in the Comic Book Universe. Doc Savage has teamed up with the Batman and the Spirit in the past. And it was Doc who first had an Arctic Fortress of Solitude. So with such a DC connection, some sort of team-up with Wonder Woman could have happened. At any rate, it's just "wish-craft" on my part as a tip of the hat to perhaps the greatest contribution made by Philip Jose Farmer to the shared universe of literature. I hope you enjoyed Wold Newton Day, which fell on the numerical sequence of 12/13/14! WELCOME TO WONDER WOMAN WEEK! All this week we'll be taking a look at the Toobworldly aspects of one particular episode of 'Wonder Woman' - "The Fine Art Of Crime". I saw the episode back in September, so why did I wait until now to give it a full week's showcase? To make it a Winter Wonder Woman Land, of course! Wonder Woman foils a ring of art thieves who use realistic-looking statues who are actually people in suspended animation to rob museums. When valuable artwork in a museum mysteriously begins to vanish, Wonder Woman discovers the museum statues may be more life-like than originally thought. I hope you enjoy the week's worth of articles about this episode! Back in the early 1960s, Porter Ricks and his wife were raising their two sons, Sandy and "Bud", in New York City while Porter worked as a park ranger on Liberty Island. 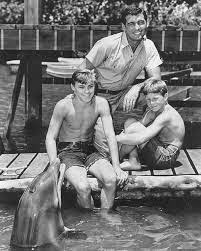 He was also studying to become more specialized with the goal of becoming a park ranger with marine skills - it had always been the dream of Mrs. Ricks that they would live in sunny Florida in a place where their sons would have a more wholesome environment in which to grow up. And she was right to worry about such things as Luke had fallen in with a gang of boys who were proving to be a bad influence on him. The next year, Mrs. Ricks died. It was most likely a form of cancer which quickly ravaged her body, leaving Porter Ricks to now raise Sandy and Bud by himself. Once he earned his qualifications to be a park ranger in a marine-based locale, Ricks packed up his family and left New York City where there were too many memories of their wife and mother. He got a position as a park ranger at Coral Key Park and Marine Preserve in southern Florida where he quickly rose to the position of Chief Ranger once his superior retired. 'Naked City' - "The Horse Has A Big Head - Let Him Worry!" In 1964, Marcel St. Clair and his cousin Timmy St. Clair were able to end the stranglehold of power which Commissar Szigeti had over Budapest and in doing so removed a true rogue from the theater of international espionage. 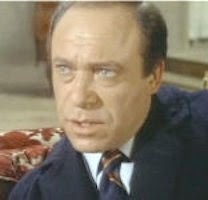 The most notable thing about Commissar Szigeti to someone O'Bserving from the Trueniverse was his remarkable resemblance to an American spy, Noah Bain. At this point in Toobworld's timeline - 1964 - Noah Bain would soon rise to a position of prominence in the SIA. But I think we have something different in this case. I believe that at some point years before we first met Commissar Szigeti, he underwent plastic surgery in order to enhance his resemblance to another younger spy named Noah Bain. Noah must have been assigned to a mission in Europe which the Communist agents hoped to either prevent, subvert, or take over for themselves. The mission must have ended as a wash for both sides since it didn't seem to hurt the career paths for either Noah Bain or Commissar Szigeti. * I think the phrase "Little Elephant" from the episode would have made for a much better title than the one used. That's even more boring than "Columbo Goes To College" and I didn't think that would be possible! Sometimes I envy my counterparts who study the shared universe known as the Wold Newton Universe. The concept was created by author Philip Jose Farmer, in which many works of literature (with perhaps an accent on pulp fiction) were connected through a shared genealogy stemming from a group of travelers and their chance encounter with a meteorite that had just crashed near the Wold Newton area in the late 18th Century. They were bathed in the radiation of the meteorite which affected their genetic make-up, so that their descendants would be more than human - possessing talents physical, mental, and creative which surpassed the rest of the population. Among the members of this "Wold Newton Family" are Sherlock Holmes, Tarzan, Doc Savage, Fu Manchu, Bulldog Drummond, and many others. 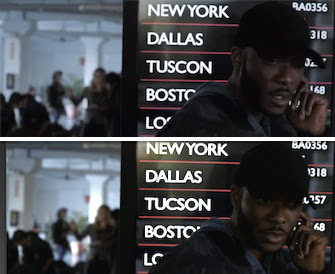 As it is geared more towards the written word (although comics and movies and television have been enfolded into the greater universe), the "WNU" can easily conflate different characters into the same person and blend alternate stories into the same timeline. It is a world of the mind in which the characters, based on descriptions provided by the original authors, can look differently to the individual reader. The Toobworld Dynamic doesn't have that luxury. Based on television, a few movies, and certain online content, the "TwD" is a fictional universe that is locked into those portrayals of characters. For example, Clark Kent/Superman must always look like the actor George Reeves and any other portrayal on TV (Dean Cain, Tom Welling, etc.) must be relegated to an alternate TV dimension. In this case, though, I may skip that rule. The first production from 1938 in the UK was presented live and is lost to the ages. It was also boiled down to a 55 minute episode and thus much of the meat of the story was already lost. The same holds true for the American version in 1949 with John Baragrey and Madge Evans in the title roles. 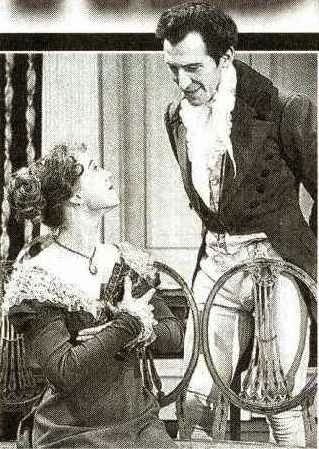 Instead, a six part series (I always lean toward series) with Peter Cushing as Darcy is the official version for Earth Prime-Time. 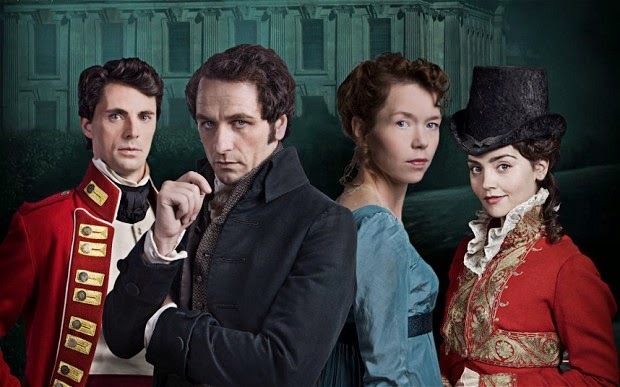 And so with "Death Comes To Pemberley", it too must be sent off to its own dimension, one in which it has to be assumed that these same characters - looking like the actors who portray them - enacted the events of the original novel but which would never be seen by the audience in the Trueniverse. The standard rule for the Toobworld Dynamic is that if its broadcast then it becomes part of the TV universe. So the finished product seen on November 11th is all that really matters. Bleep those lousy critics for tipping off the network! It would have been cool to have the Tucson of Toobworld be spelled "Tuscon" as seen in the top picture. Just another divergence from the real world. a celebrity in the Television Universe and that was depicted within the TV show which we know. 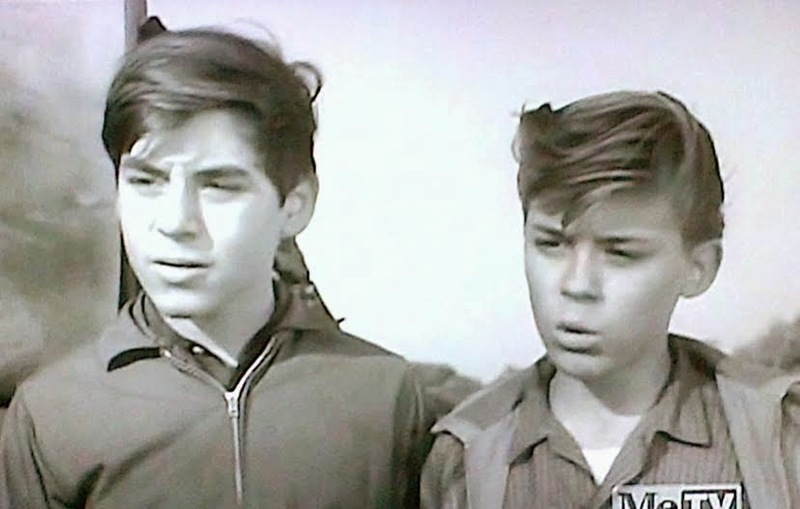 So it is not surprising that the Televersions of Lucille Ball and Desi Arnaz would find the Ricardos' life story to be worthy of a television treatment. 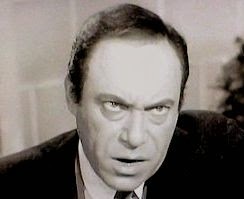 But what was a Zonk was Jake's inability to remember a single catchphrase from "I Love Lucy". Instead, he used catchphrases from "The Honeymooners", "Good Times", and "Diff'rent Strokes". Eventually everyone in Toobworld gets their own TV show, but it's hard to comprehend that these basically ordinary lives would be of interest to an audience within Toobworld. Plus, our versions were wholly created out of someone's imagination. But the televersions were based on "real"people's lives, and I wonder how were they sold to the television network executives as being something of interest? Thomas sent this pic to Scot Haney at CH 3 WFSB. 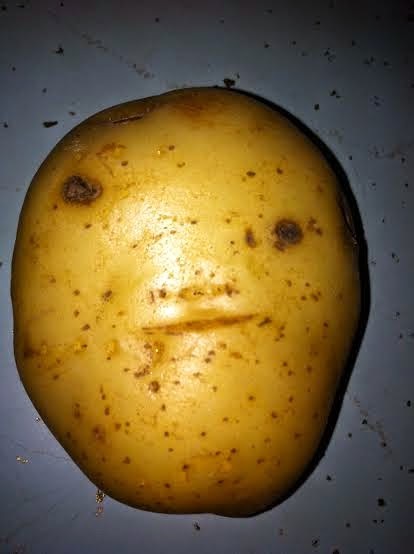 Scot collects pics of food with faces in it. He mentioned Thomas' name on air at 5:45am today. The mention of my nephew's name on TV in Connecticut establishes the presence of his televersion in Toobworld. Maybe some day he'll be appearing as himself in fictional settings and join his uncle in the Television Crossover Hall Of Fame. It's aways fun to see "History" captured in old TV shows and movies, but this usually happens with locations - like the slums of "West Side Story", the scaffolding around the Statue of Liberty in the "Remo Williams" movie, and Vienna after war as seen in "The Third Man". 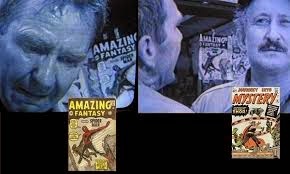 That comic book in the background is "Amazing Fantasy #15", which came out n August 1962. 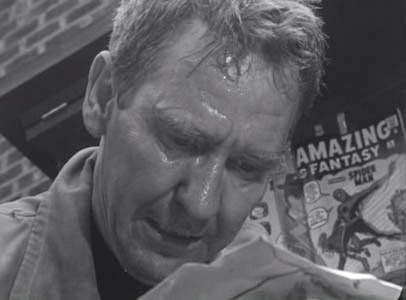 This episode aired a few months later, so we can place the date of Duncan Kleist's death to happening within the sell-by dates for that comic book. So why is that comic book historical? Amazing Adult Fantasy and its retitled final issue, Amazing Fantasy, is an American comic book anthology series published by Marvel Comics from 1961 through 1962, with the latter title revived with superhero features in 1995 and in the 2000s. The final 1960s issue, Amazing Fantasy #15 (cover-dated August 1962), is the title that introduced the popular superhero character Spider-Man. Amazing Adult Fantasy premiered with issue #7, taking over the numbering from Amazing Adventures. I wonder if some grip on that production dropped the dime (or whatever the issue cost) to buy that comic so that he could have something to read on the subway ride home. And how many viewers to this day see that just hanging there in the background and wish they could reach through the TV screen to pluck it from its video memorial? And even more enticing - Journey Into Mystery #83 was also on sale at that news stand. This is the comic book which introduced Thor, the Norse god of thunder! But that's outside the box. Within the reality of Toobworld, that comic book is a headache causing Zonk. 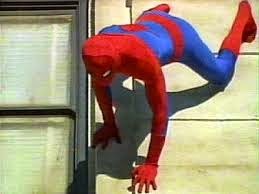 In 1977, 'The Amazing Spiderman' made his debut in Toobworld, but Peter Parker had been operating as the web-slinger for a few years before that. Certainly not going back to 1962, however. Basing the age of Peter Parker on the actor who played him (Nicholas Hammond), Parker/Spiderman was 27 years old when we first saw him catching thieves just like flies. And that means he was only 12 years old when that comic book was published. Peter was most likely no more than fifteen/sixteen when he first gained his powers as far as his life story in the comic books was concerned. But for Toobworld, we're going to have to say that he was still in grade school when he was bitten by that radioactive spider in order to make this comic book jibe with the rest of Spiderman's timeline. 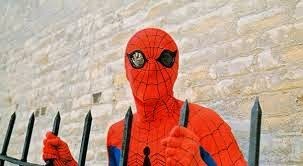 Peter Parker was bitten by a radioactive spider when he was around 11, 12 years of age. Lee was a friend of the Parker family and while the little boy was fighting for his life, he collaborated with Steve Ditko on a short comic book story which imagined young Peter having pulled out of the crisis with new spider-based super-powers. Once he was about twenty, maybe twenty-one, Peter Parker decided to actually become the Spiderman of the comics. (By that point in time, the character had taken off in popularity.) 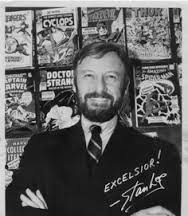 He kept his identity a secret and even though the comic book existed and was based on a "true" story, no one thought to link one to the other - not even Stan Lee himself. Even close friends would never have believed their friend could be that costumed crime-fighter. Peter Parker is in his sixties now, and maybe he might still be seen in the main Toobworld, albeit with an alias to protect himself. So let me know if you think this splainin works to reconcile these two shows.